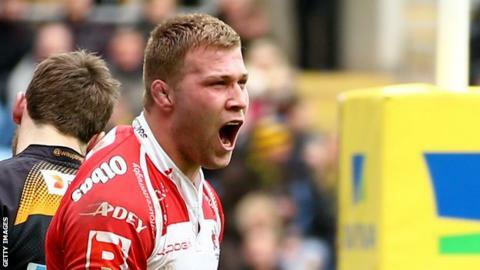 Gloucester flanker Ross Moriarty should play in Wales if he wants to further his international career, says Wales forwards coach Robin McBryde. Moriarty, 21, is one of 10 members of Warren Gatland's squad based in either England or France. He played twice during the 2015 World Cup, but has not figured in this year's Six Nations tournament. "If he (Moriarty) really wants to push for his case then he's got to be playing in Wales," said McBryde. However, Gloucester boss David Humphreys says Moriarty's Wales honours are a result of his form for the club. Forwards: Tomas Francis (Exeter Chiefs), Luke Charteris (Racing 92), Bradley Davies (Wasps), Dominic Day (Bath Rugby), Ross Moriarty (Gloucester Rugby). Backs: Rhys Priestland (Bath Rugby), Jonathan Davies (Clermont Auvergne), Jamie Roberts (Harlequins), George North (Northampton Saints), Matthew Morgan (Bristol Rugby). Former Ireland fly-half Humphreys told WalesOnline: "Ross signed a long-term contract with Gloucester last year, his development has been ongoing and that was reflected in his selection for Wales in the World Cup. "He's an important part of our squad, he wants to be here and until I have seen the context of the comments it's hard to add much more. "Most players have international ambitions and are at different stages along that development. "The only way to get that recognition is to perform week in, week out at a high level in a club shirt. "That's what got Ross his selection, he performed really well for Gloucester and that won't change." Four of Wales' exiles start against France on Friday in Cardiff: lock Bradley Davies and three-quarters Jonathan Davies, Jamie Roberts and George North. Two more are on the bench: prop Tomas Francis and fly-half Rhys Priestland.